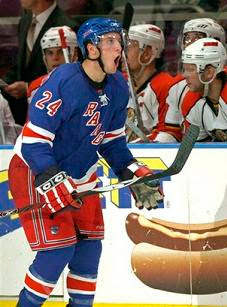 The New York Rangers beat the Florida Panthers 5-2 last night scoring four goals in the third period after getting off to a slow start. 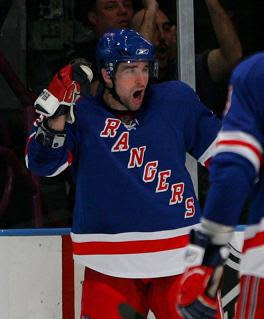 Chris Drury scored the game winning goal and had two more assists as quickly begun earning his big $35 million contract. The Rangers got their season off quickly when Michal Rosival scored a goal 37 seconds in, but then seemingly took the next two periods off. "The first 10 minutes I thought we were OK, the second 10 minutes of the first period we were not very good, and in the second period, for me, there was only one team on the ice and it wasn't the New York Rangers," Tom Renney told the NY Post. The Rangers left the ice after the second period and the fans let the team hear their disappointment with a chorus of boos. It didn’t take long for the team to turn things around and after Petr Prucha tied it Drury did what he does best, scored a big goal. His first goal would eventually become the game winner and he would add a second assist on Martin Straka’s goal late in the game. Dispite the slow start the first line played very strong. Between the three players on the top-line, Drury, Jaromir Jagr, and Straka, they scored a total of six points (2 goals 4 assists). As the Rangers left the ice after the game ended fans at the Garden cheered, “"We want the Cup!" Overall the game was a positive one. The team from Broadway played poorly through the first two periods, but had enough talent to put the Panthers away in the final frame. The weakest link on the team is going to be the defense and Marek Malik and Rosival were impressive. Marc Staal usually looked like a guy who had never played in the NHL before, but managed to make a few strong plays to show the promise scouts talk about. As usual Henrik Lundqvist played a strong game. He only allowed two goals one of which only scored when rookie Brandon Dubinsky impeded his motion to stop a puck to his left. The King was impressive keeping the Rangers in the game until they got it together enough to score some goals. Aside from Drury the most impressive part of last night’s victory was the contributions the team received from the third-line of Prucha, Ryan Callahan, and Dubinsky. Prucha tied the game and Callahan was impressive putting them ahead 4-2. If that line can continue to pitch in this team is going to be very strong throughout the season. Read more Rangers articles @ The Hot Stove.